PPS Launches a New, Multi-functional Leak Test System from Sepha at Scanpack. A Sepha Multi-Q is a standalone, multi-functional, non-destructive leak test system that can be used in combination with interchangeable test methods to fit the full range of container types available on the market today. The multi-functional system offers an all-in-one solution to test the integrity of all types of containers including sachets, pouches, bags, bottles, vials, ampoules, trays, devices and modified atmosphere packaging (MAP). 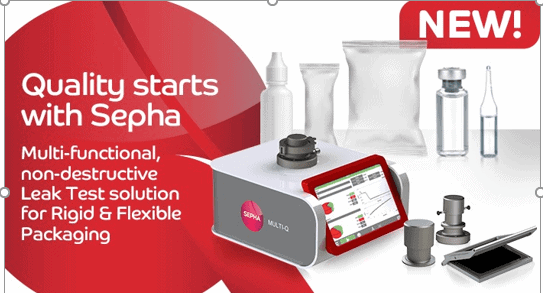 Using non-destructive methods including vacuum decay, pressure decay and a vacuum flexible membrane, the Sepha Multi-Q provides the flexibility to test different containers in variable sizes for defect types including cracks, channels, gross holes as well as pinholes down to 5µm. The Sepha Multi-Q has been developed for the pharmaceutical, medical device and nutraceutical industries providing a multi-functional, cost effective and reliable packaging leak test system for manufacturers that require high levels of quality control and cost reduction. The lab-scale unit has a small footprint and offers the flexibility to switch between test methods depending on product and specified test requirements. Test methods can be easily changed and are automatically detected by the system once in place. The relevant recipes for the selected method will be available to start testing immediately. The non-destructive and deterministic test methods provide quick, reliable and repeatable results enabling customers to improve the accuracy of their leak detection procedures and reduce cost as the method prevents the packaging from being damaged. Flexible Membrane, Vacuum Decay, Pressure Decay, Ramp to Event, Ramp to Proof Pressure and Occlusion. Visit PPS at Scanpack (booth B03:60) to see the Sepha Multi-Q many opportunities.